Ever since the early discoveries of gold in the United States, prospectors have been exploring new areas for significant gold discoveries. Kansas has attracted the attention of gold prospectors on a number of occasions, but no significant deposits have ever been found within the state. A few attempts to deceive potential investors caused a few years of interest in Western Kansas during the early years, but that excitement didn’t last long. The discovery of gold near Denver, as well as other gold strikes caused some very real excitement to the east in nearby Colorado. Unfortunately, the rich ground that caused the Pikes Peak Gold Rush in Colorado did not extend eastward into Kansas. There were a handful of periods of excitement when gold was supposedly found, but these were short lived and are not believed to actually have produced any gold. 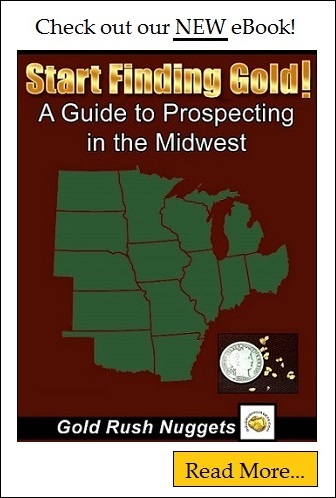 If gold were to be found in Kansas, a prospector would be advised to search a few known areas. In the far northeastern corner of the state, glaciers once covered a small part of Kansas. These glaciers brought down gravels from gold bearing areas in Alberta, Canada. This gold is almost always extremely fine textured flour gold and can be difficult to retain without careful panning technique, but it is present in many of the creeks in the area. Explore the areas east of the Big Blue River and north of the Kansas River. The larger rivers that flow out of Colorado also have small amounts of placer gold, since they drain some known gold bearing areas. Unfortunately, they are several hundred miles from the significant gold districts of Colorado, so any gold that is found is also likely to be extremely small. The larger gold flakes and nuggets just don’t travel downstream very far, but floods can push fine flour gold for long distances, so there is potential to find gold in throughout the Arkansas and Smoky Hill Rivers. Gold can be found in Kansas, but on a very small scale that would interest recreational gold prospectors. There are no verified reports of any commercial gold mining endeavors within Kansas. Although the gold is small, it is present and can be recovered by careful gold panning. If you are serious about finding gold it would definitely be worthwhile to explore the nearby states of Colorado and Wyoming, where more significant gold has been found in the past.